creative savv: What's the difference between homemade gifts and hand-crafted gifts? What's the difference between homemade gifts and hand-crafted gifts? A homemade gift is shoved in a box with no afterthought to how it's presented. But a hand-crafted gift is "finished" with a nice label, a cute wrapper or nice tie/ribbon, and it might just look like something you'd pick up at a craft fair. At least that's my definition. Presentation indicates the time, love and thought put into the gift. As I'm finishing making something, I start to plan in my head how I'll put the final touches on the gift. how I'll package it, will I put a label on it or just a nice ribbon, what kind of ribbon do I have on hand to use, or will I need to "make" my own ribbon -- those kinds of plans. Remember the dish cloths for my step-mom? Here, they are, finished. 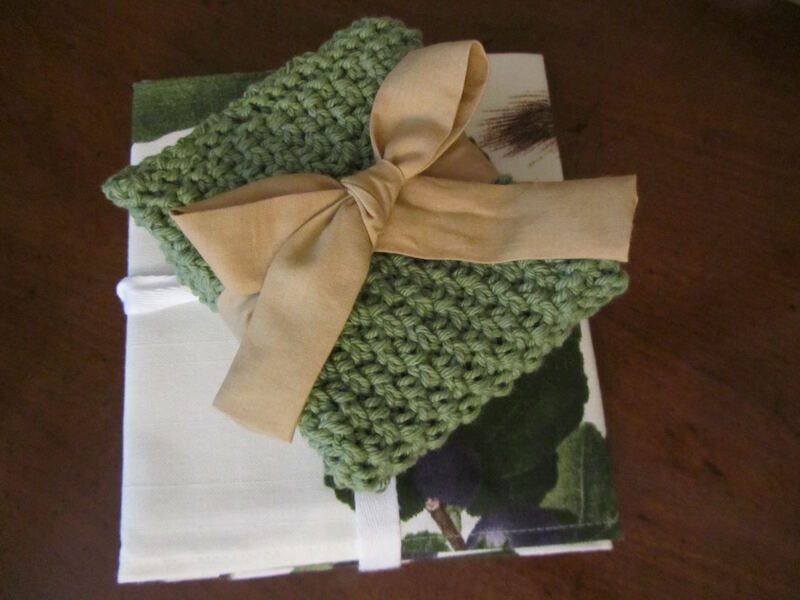 I made a set of 3 dish cloths to go with other items, for her. I could have put the 3 into a gift box, maybe with tissue paper. And that would have looked okay, not bad, but okay. 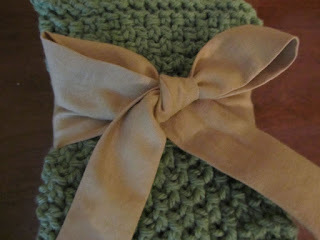 Or, I could take just a few minutes and "finish" the gift, with a nice presentation. I didn't have a ribbon I wanted to use, so I made my own. Yes, you can make ribbon! 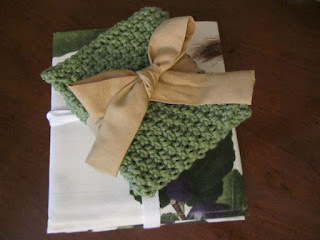 I used a 3-inch strip of fabric, long enough to wrap around the bundle of wash cloths. I sewed the fabric scrap into a long tube, turn it right side out, and pressed smooth. After tying this new ribbon around the bundle of cloths, I clipped the ends to length, and tuck the raw edges into the tube, finger-pressing the edges nicely. Took all of 5 minutes to make, but it really adds to the presentation of the gift. You hit the nail on the head. You are very good at presentation, Lili, whether it's your dining room table, your deck, or your gifts. And it does make a difference. I agree, presentation is everything. It can make the most simple gift look very special. Nice idea on the handmade ribbon, Lili. I agree, presentation makes the homemade stand out, like the frame to a picture. As you said, it communicates "there in lies something special." I think I should start doing that too, but I feel what I make is not gift worthy. In fact, I'm my worst critic and am never completely satisfied with how something turns out, yet I love making stuff and tweaking it to get a better outcome. The unsatisfying feeling is what keeps me trying. Out of the five dish cloth pattern attempt, two are tucked in my kitchen drawer for our use (need to try them out since I have never used knitted dish cloths before), another turned out too large following the pattern's instruction using two strands, and two became rag rugs using t-shirt type yarns (too heavy, stretchy, lacks the rug look). None are to my satisfaction, ok for our use but not for gifts. I was discussing this with my husband, and he suggested maybe I'm not using the right materials, just what is on hand, instead of buying what I need...hmmm good point. 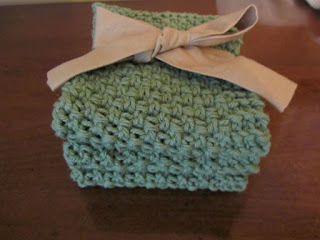 I love how your dish cloths turned out, they are so beautiful and gift worthy!! I am sure your step mom will be thrilled to receive a handcrafted gift made with so much thought and care. I do find myself becoming very particular, when I'm making a gift for someone else to use. With the knitted cloths, I'll work very hard to get them as close to perfect as possible, including unraveling entire cloths if they come out wrongly sized. That's the perfectionist in me. If it's for our own use, I'm not so picky. Your husband may be onto something -- maybe the supplies aren't quite what you need for the particular application. Have a good day, yourself, YHF! Oh wow...I still have stuff I've made that I haven't unraveled simply because. They are not used either. I noticed I left out the word "love", maybe that's what's missing in my work too. I'm a perfectionist but it is not with the intent of the user, but trying out another "what if" idea or solution. It's hard to unravel something that I've put a lot of work into already. But for me, if it means I then can rework the item and make it how I really want, it's worth the "cost" of undoing all that work. Have a great evening, YHF! 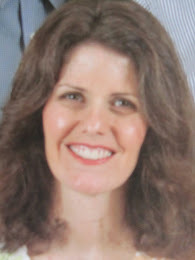 I don't usually take exception to your "take" on anything (yours is one of my favorite blogs! lol) but I do here... I see absolutely nothing wrong or inferior to a gift made with love by hand that is "shoved into a box with no afterthought to how it's presented" that is given as a gift to a loved one. I tend to invest my time in the making of the gift and spend way less on presentation...way less! My gift is still handcrafted, homemade, and made with love, and appreciated just as much by the recipient. I see "handcrafted" and "homemade" as synonyms rather than one term being somehow less than the other, so perhaps it's just a matter of our vocabulary! What? You don't agree with 100% of what I write?!! Ha ha !! I think part of the difference may be that I still have a few people on my gifting list who are not exactly keen to receive a gift that I've made. So, I go the extra mile to present something as good or better than anything they could find in a store. I'm still "selling them" on the idea that hand-crafted is equally lovely. Otherwise, I get what you're saying. And I welcome dissenting opinions, here!! It has been my experience over the years that the people who most appreciate a handmade gift are themselves creative people. 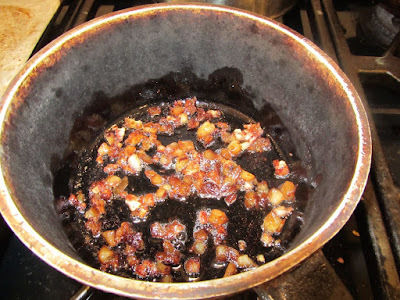 More than a few times I've opted NOT to give a homemade gift because I knew the gift wouldn't be appreciated. And at other times the recipients of my gifting have been thrilled. And nothing is more satisfying than giving a homemade gift to someone who appreciates the time and effort. I crochet dishcloths. I cannot count how many dishcloths I've crocheted over the years. And recently an internet friend sent me one that she had made. I love it! You have a great evening too! And again...I love your blog. I get so much inspiration here. Thanks for sharing!